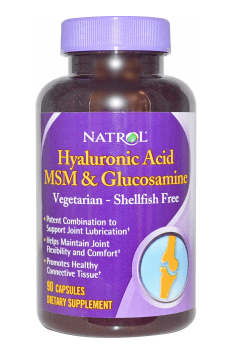 Hyaluronic Acid MSM & Glucosamine is and ideally composed dietary supplement containing a concentrated dose of ingredients, allowing to maintain healthy joints. In the composition of the preparation there are: glucosamine hydrochloride, hyaluronic acid and methylsulfonylmethane (MSM). The supplement increases the resistance of joint cartilages to strain, stimulates regeneration receptors, slows down the processes of joint cartilage destruction and alleviates pain symptoms related to rheumatic ailments. The preparation is recommended especially to people, who are prone to the increased risk of the occurrence of the premature joint cartilage usage syndrome, among whom the main group are the people experiencing frequent injuries and overloads caused by their profession (sportsmen, massagers, physical workers) and also obese people. Moreover, the supplement is recommended to people dealing with rheumatic ailments and to elderly people, as with age the substances responsible for maintaining structural stability of joint cartilage are reduces. Hyaluronic Acid is a polymer physiologically appearing in all living organisms, mainly in the form of sodium salt of sodium hyaluronate. The highest concentration of hyaluronic acid occurs in connective tissue, skin, epithelium, cartilage and synovia. This compound constitutes a basic component of synovial fluid and is responsible for its tenacity and elasticity and moreover it nourishes joint cartilage and hydrates its surface, increases range of movement and reduces inflammatory mediators secretion. With age and also in the course of degenerative joint disease, the concentration of hyaluronic acid is reduced, which unfavorably influences the structure of the elements creating a joint. Moreover, hyaluronic acid allows to maintain proper shape of cells, ensures the appropriate level of hydration and skin flexibility and also supports collagen and elastin biosynthesis, thanks to which it protects against the loss of skin flexibility and supports anti-wrinkle care. Glucosamine is a substance which naturally occurs in the human organism. It is synthesized from glucose and glutamine in the presence of glucosamine synthetase enzyme. Similarly to hyaluronic acid, the production of glucosamine is reduced with age. Because of the fact that glucosamine does not appear in commonly eaten food (shrimps, crawfish, shellfish), it is worth complementing its level by means of supplementation. Glucosamine fulfills an incredibly vital role in the proper functioning of the movement apparatus, as it is essential for glycosaminoglycans and proteoglycans production, which are the components of intercellular cartilage substance. Moreover this substance contributes to the inhibition of the activity of enzymes, which are responsible for joint cartilage degradation. Scientific research showed that glucosamine supplementation may bring benefits in the form of alleviating symptoms of degenerative joint disease (especially knee joints), supporting regeneration and slowing down the processes leading to wearing off the cartilage. MSM (methylsulfonylmethane) is a substance containing in its composition organic sulfur. This compound has anti-inflammatory and antioxidative properties, which are crucial for maintaining proper functioning of joints. MSM provides sulfur to build amino acids such as methionine and cysteine as well as other important components (enzymes, antibodies) and moreover it takes part in collagen and creatine synthesis, which explains its positive influence on the structure of joints and blood vessels, as well as skin, hair and nails. Summing up, Hyaluronic Acid MSM & Glucosamine is a dietary supplement created for people, who are prone to the increased risk of joint damages as a result of overload as well as because of the weakening of their structure, age or other factors. The supplement also contributes to reducing pain symptoms of degenerative joint disease, which translates into the decreased need of taking painkillers and simultaneously increased well-being and comfort of life. The preparation positively influences not only movement apparatus, but also it may serve as perfect supplementation of hair, skin and nail care. Hyaluronic Acid MSM & Glucosamine 90 caps. The use of MSM is a natural way to reduce pain and inflammations without side effects. MSM can bring similar relief as some usual painkillers, but it does not work so fast. Just after a few days of saturating body tissues with MSM, we feel pain relief and burst of energy. The formula also supplements diet with glucosamine – a substance necessary for proper regeneration of cartilage and synovial fluid. It is recommended especially for the elderly and people doing hard workouts who feel discomfort and pain caused by impaired joint function. Natrol is a leading manufacturer and supplier of vitamins and dieatry supplements, located in the USA. Their products are completely natural, and made only from high quality ingredients, what makes them very effective and safe.